The reputation that Quantum Key West Race Week has for being the best sailing event in North America is built on several important elements: the best sailors come from all over the world to compete here in mid-January every year, the venue is spectacular, and the race management by the Storm Trysail Club is second to none. And another important element is the boats themselves, and for decades the hottest one designs have been coming to Key West to produce the closest and most exciting racing at the event. There are nine one-design classes entered at Quantum Key West Race Week, including the Melges 24, J/70, J/80, J/88, J/111, J/122, C&C 30, Farr 280 and Viper 640 classes. Among these, the new C&C 30 Class is making their competitive debut in Key West with ten teams entered from the US, the UK and Norway. 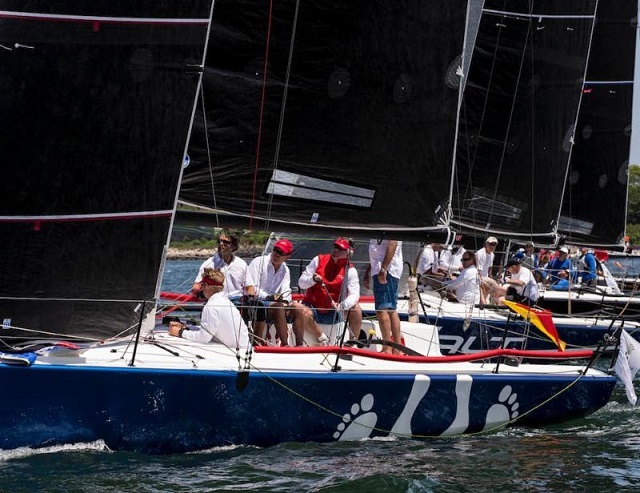 One of these teams is led by James Madden from Newport Beach, CA, a four-time veteran of the event who has captured class honors with his J/125 in 2007, 2008 and 2011, and owner of numerous boats over the years named Stark Raving Mad. He got a taste of one-design competition in the Swan 42 class and liked it, so when searching for a new boat, he was seeking something a bit more on the cutting edge, and found exactly what he was looking for in the C&C 30. This high-performance boat designed by Mark Mills combines a stiff, slippery-fast hull with a powerful sail plan with an efficient deck layout inspired by the TP52 class. “I was looking for a fun sport boat and the C&C 30 checked all the boxes,” said Madden, who has owned nine different types of boats since 2000 and still campaigns a Swan 601. He took delivery in June, 2015 and promptly placed third in the C&C 30 class at the New York YC Annual Regatta, where there were nine new boats on the line. Storm Trysail will also provide distance racing for Performance Cruising designs, whose skippers would prefer to sail one long race that traverses the keys as opposed to multiple buoy starts. This should be appealing to more casual racers who may not be participating with a complete crew or simply prefer navigation-style courses. The Performance Cruising Class will sail using the Offshore Racing Congress’s (ORC) ORC Club worldwide rating system – this and the new ORC Class will be the debut of ORC use at this event. Storm Trysail is also bringing back a class that was once a staple of Key West Race Week – the Corsair 28. Those speedy trimarans have not competed in the regatta since 2011 when they were part of a Multihull Division. For one-designs and other boats under 25 feet in length, Storm Trysail Club is assisting with their logistical needs with a dockage package option. These packages are specifically intended for Viper, J70, Melges 24 and J/24 teams. For more information on this, the classes racing and how to enter Quantum Key West Race Week, visit keywestraceweek.com.